The race is on to optimize solar energy's performance. More efficient silicon photovoltaic panels, dye-sensitized solar cells, concentrated cells and thermodynamic solar plants all pursue the same goal: to produce a maximum amount of electrons from sunlight. Those electrons can then be converted into electricity to turn on lights and power your refrigerator. At the Laboratory of Photonics and Interfaces at EPFL, led by Michael Grätzel, where scientists invented dye solar cells that mimic photosynthesis in plants, they have also developed methods for generating fuels such as hydrogen through solar water splitting. 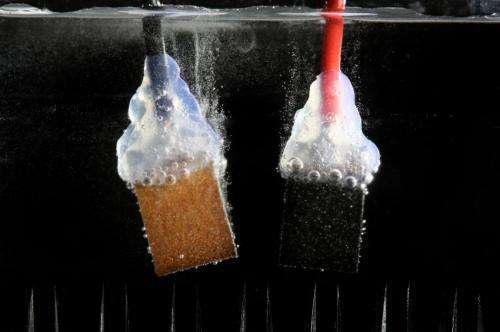 To do this, they either use photoelectrochemical cells that directly split water into hydrogen and oxygen when exposed to sunlight, or they combine electricity-generating cells with an electrolyzer that separates the water molecules. By using the latter technique, Grätzel's post-doctoral student Jingshan Luo and his colleagues were able to obtain a performance so spectacular that their achievement is being published today in the journal Science. 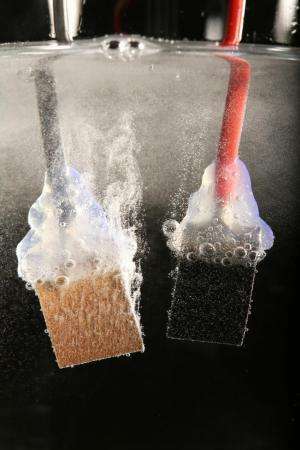 Their device converts into hydrogen 12.3 percent of the energy diffused by the sun on perovskite absorbers – a compound that can be obtained in the laboratory from common materials, such as those used in conventional car batteries, eliminating the need for rare-earth metals in the production of usable hydrogen fuel. "Both the perovskite used in the cells and the nickel and iron catalysts making up the electrodes require resources that are abundant on Earth and that are also cheap," explained Jingshan Luo. "However, our electrodes work just as well as the expensive platinum-based models customarily used." On the other hand, the conversion of solar energy into hydrogen makes its storage possible, which addresses one of the biggest disadvantages faced by renewable electricity—the requirement to use it at the time it is produced. "Once you have hydrogen, you store it in a bottle and you can do with it whatever you want to, whenever you want it," said Michael Grätzel. Such a gas can indeed be burned – in a boiler or engine – releasing only water vapor. It can also pass into a fuel cell to generate electricity on demand. And the 12.3% conversion efficiency achieved at EPFL "will soon get even higher," promised Grätzel. These high efficiency values are based on a characteristic of perovskite cells: their ability to generate an open circuit voltage greater than 1 V (silicon cells stop at 0.7 V, for comparison). 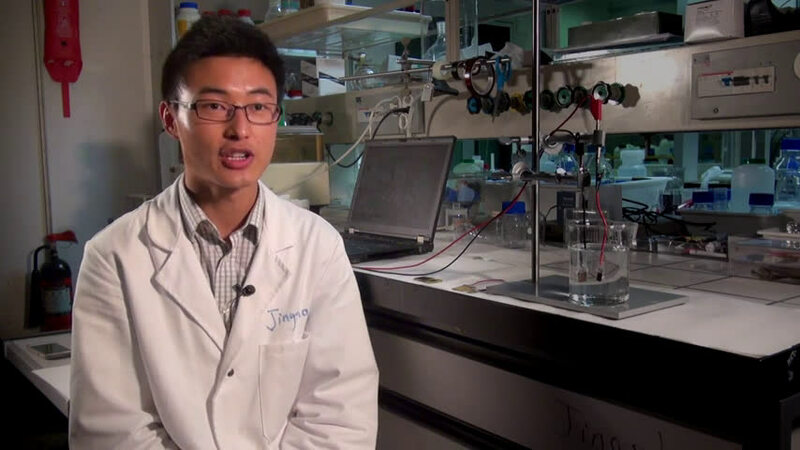 "A voltage of 1.7 V or more is required for water electrolysis to occur and to obtain exploitable gases," explained Jingshan Luo. To get these numbers, three or more silicon cells are needed, whereas just two perovskite cells are enough. As a result, there is more efficiency with respect to the surface of the light absorbers required. "This is the first time we have been able to get hydrogen through electrolysis with only two cells!" Luo adds. The profusion of tiny bubbles escaping from the electrodes as soon as the solar cells are exposed to light say it better than words ever could: the combination of sun and water paves a promising and effervescent way for developing the energy of the future. A way to separate components of a solution? It makes sense in certain situations, as all alternative sources do. For cars it might be a problem but not for storing it for home cooking and heating uses. Hydrogen pumped into homes is a massive explosion hazard, and it's going to leak a lot along the way anyhow due to its very small molecule that diffuses through metal pipelines. Rather, it's better to store it in low pressure gas bells near power stations, or be further modified into synthetic methane for use in cars. Yet if this technology was used at the home, then all of the above posts are irrelevant!! That is where this breakthrough is aimed. Home production and storage, the holy grail!!! Nonsense. The best fuel from the sun is Helium 3. Thousands of years to power society with fusion energy is available to mine on the moon. Only China has a plan to to so. If we are sane, (and, of course, by today's standards that is very much in doubt) the rest of humanity will join in. @thingumbobesquire So you are promoting a technology that has NOT been demonstrated, over a technology that HAS!!! Well done mate!!! Please keep practical science well in mind before casting opinions. I mean WOW lets tell everyone about anti-matter technology hey!!!! Nope practicality and affordability is what THIS article is promoting, not some STATE based super technology, way off in the future!!!! Unpressurized hydrogen has an energy density of 12.7 MJ/m^3 which is just about 3.5 kWh or the equivalent of four large marine batteries. An average household that spends 25,000 kWh a year for heating/cooling and electricity would need to dedicate on the order of 20 cubic meters for a hydrogen bell to contain enough energy for a single day. The necessary gas bladder would inflate to the volume of an entire room of about 100 sq.ft in floor area. Pressurized hydrogen would take a smaller space, but it would run a much greater risk of leakage and would require energy to pressurize it. Eikka, I didn't say pump it to homes. I totally agree there. The current piping for propane or regular natural gas is rather inadequate. Having a home generator for it though would be a totally different scene. Nobody has come up with one that would efficient enough to really make it economically worthwhile yet though. A home tank wouldn't have to have high pressure. Just enough to maintain the systems of the house while it's being replenished by a hydrogen generator of some sort. Add some of that smelly perfume they add to indicate any leaks in the system and it wouldn't really be very different than running a propane or natural gas in a home heating or cooking setup.